very fascinating, seeing sheep in the streets, while the cars find their way around them. Don’t worry, I was the front-seat passenger on this trip. So, I was able to take some amazing and quite surprising images during driving. Now, Christmas is nearly over. But, here in Germany, Dec. 26th is also a holiday. We celebrate Christmas on Dec. 24th = Christmas Eve. That night, Christ child brings the presents for the kids (and the adults). The two following days are used for visiting the relatives. Often, one day for the parents and the other day for the parents in law. So, we have three days of presents for the kids. Three days of good food. So, I have a gift for you, too. 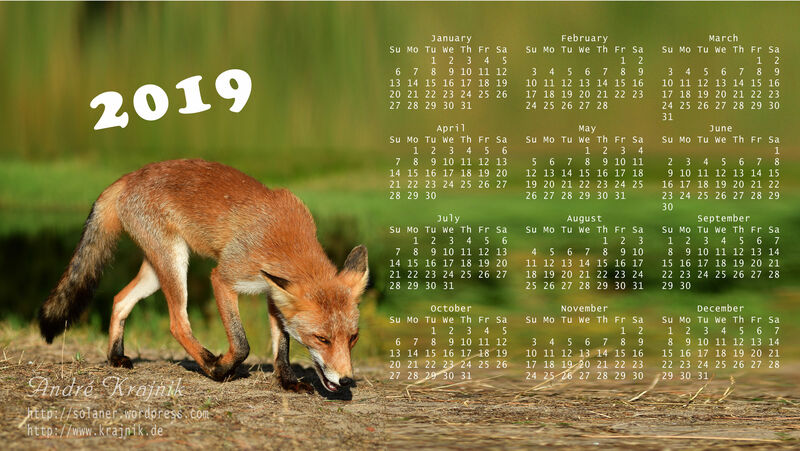 I prepared a calendar for 2019 to be used as a background wallpaper on your computer. To download it, you can simply right-click on the link above or on the image below and save the image to your computer. Next, you can promote the image to be the desktop wallpaper for the next year or print it for hang it on your fridge or your wall.